Wells said he would like to try out experiential learning more. “Mr. Crabb, (chemistry teacher Upon learning that her class Victoria) Conner and I are trying would see a World War I docuto do a few (day trips) with sophomentary at Century Arden 14 and mores, maybe after AP exams are XD (1590 Ethan Way) on Feb. 6 as over,” Wells said. part of the World Cultures curHowever, Wells said he isn’t riculum, sophomore Erin Wilson sure if these trips would be fundwas surprised by the cost. ed by the miscellaneous high “We got popcorn, candy and school budget, which was used to soda, and we didn’t have to pay purchase tickets and for our field trip to the snacks for the sophomovies,” she said. more theater trip. We got popcorn, candy and soda, After all, as a cellist, “The Miscellaneous and we didn’t have to pay for our she is used to paying High School Core Infor the Forum Mu- field trip to the movies.” structional Program sic Festival that the —Erin Wilson (is for) what we hadn’t orchestra, band and thought of, like science choir attend each year. equipment,” Wells exBut then the varsiGrow Old,” which was not yet plained. “We build a cushion for ty volleyball player remembered available on DVD, to his students, what hasn’t been budgeted.” that earlier this school year, the he arranged the trip. But the difference between the team didn’t have to pay for the According to Crabb, field trips theater trip and other classes’ stucharter bus to a game in Merced. are ideally planned months in dent-paid trips — such as jourThese differences stem from advance, but since the theater ar- nalism conventions and music variations in budgets, sports and ranges showtimes only two weeks festivals — is that it was local. performing arts boosters funding ahead, he and head of high school “There are a lot of great opporBrooke Wells acted fast. tunities here in Sacramento that and the nature of the trip itself. osophical exemptions for personal, ue attending Country Day. make it very unlikely that you will moral or other beliefs. After finding his immunization be infected,” Whited said. “However, Because of this leniency, a medi- record, Lacombe went to his local if a person is not boostered properly an 2.2 percent of kindergarten chil- doctor to ensure he had all the re- for a vaccination, there is always a dren nationwide claim exemptions quired vaccinations. possibility for infection.” to vaccination, according to a Feb. 21 Nationwide, an extremely small Even though Lacombe had all the Washington Post article. required vaccinations, his doctor percentage of students claim reliCalifornia schools are required couldn’t verify if he had received the gious or medical exemptions from to request vaccination records for correct dosages. vaccination. The largest percentage students entering kindergarten and “Apparently, different countries of exemptions is for personal beliefs. seventh grade. Current students in have different doses of vaccines,” LaDaniel Salmon, a professor at eighth grade or higher are not re- combe said. “So while one country Johns Hopkins Bloomberg School quired to be vaccinated if they had might give one vaccine in two doses, of Public Health in Baltimore and a personal or religious belief exemp- another might give it in four. director of the Institute for Vaccine tion before SB 277 was passed — one “My doctor could not verify Safety, said in a public statement: reason the high school is only now whether or not I had all the correct “Most people who have concerns auditing records. doses without a blood test, so I opt- aren’t ideologically opposed to vacBy seventh grade, cines. They just don’t children are required to trust the science, they’ve be vaccinated for 10 disIf a child is infected with some sort of been misinformed, or eases: tetanus, diphthepathogen, it could spread from child they hold different valria and pertussis (Tdap); ues.” haemophilus influenzae to child or family to family very quickly.” One rumor that has —Kellie Whited plagued the country in type B; measles, mumps and rubella (MMR); porecent years is that vacliomyelitis; hepatitis B; cines can cause autism ed to simply get six of the vaccines spectrum disorders in children. and varicella (chickenpox, VZV). Even the University of California again instead of waiting around for “It has been definitively proven system updated its vaccination pol- my blood test results.” that vaccines do not cause autism,” In one sitting, Lacombe received Whited said. icy on Nov. 15, 2016, requiring the MMR, VZV and Tdap vaccinations the polio, Tdap, hepatitis A and Whited added that the doctor for all incoming students, in addi- B, VZV and HPV vaccines, which who published a paper asserting tion to the meningococcal conjugate caused him to get lightheaded. vaccines cause autism, Andrew “After the first three, I got really Wakefield, had his medical license (meningitis) vaccine and a tubercunauseous and thought I was going to revoked. Whited attributed the sublosis screening questionnaire. A vaccine is typically an extreme- throw up,” Lacombe said. “I just had sequent trend of misinformation to ly weak or a heat-killed version of to lie down for a bit, and then I was social media and word of mouth. fine, but I’ve never had a reaction the specific pathogen. “Trendy topics like this tend to “Once a vaccine is introduced into like that to a vaccine before.” spread very quickly because it’s inDespite the trouble, Lacombe teresting and shocking, and many your system, your immune system can begin to learn how to fight the said he still believes in a zero-toler- people do not take the time to do pathogen,” biology teacher Kellie ance policy for anti-vaccination. their research and check the validity “There is no merit in not vaccinat- of the claims before spreading it to Whited said. “So upon second exposure, your body is able to neutralize ing your kids,” Lacombe said. “I am someone else,” she said. the pathogen and prevent you from a pretty niche case, so it was a shame “By then, the initial statement it affected me the way it did.” being infected.” has been so warped and taken so Ninety-seven percent of students out of context — kind of like a game Senior Jacqueline Chao was one student whose family received an in the March 7 poll agreed with of telephone — that what is being email from Velo. Chao was missing Lacombe, while 3 percent did not spread is so far from the truth that both her immunization record and answer whether they believed in it is impossible to put a lid back on vaccinations. In that poll, 84 percent that rumor.” the Tdap booster. For Chao, this wasn’t a problem, of students reported being fully vacFifteen percent of the polled stuas when she came to the U.S. from cinated, 3 percent were not and 13 dents reported knowing a family China, she received all her vaccina- percent did not know. member or friend who does not beWhited said that when it comes to lieve in vaccinations and/or believes tions and kept her records. Her host family recently took her to get the vaccinations, “It’s infinitely easier to that vaccines cause side effects such prevent than to treat.” required booster as well. as autism. “Children come in such close conFor senior Mehdi Lacombe, howTwo high school students detact with each other while eating clined to be quoted about their anever, the new law caused a problem. “I have all my vaccinations,” La- and playing that if a child is infected ti-vaccination viewpoints and those combe said. “I received most of them with some sort of pathogen, it could of their family. in France and Belgium as a child, spread from child to child or family Facebook has reportedly played but my family initially displaced my to family very quickly,” she said. a large part in spreading false inforAs of Jan. 28, 25 of the 35 confirmed mation about vaccinations, with the immunization record, most likely cases in the Washington measles company only recently announcing during our move to America.” Lacombe, like Chao, said the outbreak were children under 10, its steps to reduce the distribution of school sent multiple emails to his with only one adult case being re- health-related misinformation. mother about the missing records ported, according to an NPR article. A parent herself, Whited stressed Vaccinations are as close to a cure the importance of vaccinations in and recently called her to inform her that if his immunization record as possible, Whited said. preventing life-threatening diseases. “For very few things is there a was not turned in within 30 days, La“It is our duty as parents to protect combe would not be able to contin- cure, but vaccination is a way to our children,” she said. other schools have larger teams, Country Day is often at a disadvantage. For baseball, most other teams had 14 to 16 he good news for Country Day is 20 players signed up for the tennis team players last season; meanwhile, Valley Christian Academy had around 20, and Alpha Charand 18 for the baseball team. The bad news is there’s a large gender ter — the section champion — had well over imbalance in tennis, and the baseball team has 20 players, according to Jakobs. “Almost all big Division I-III private schools already lost several players. The tennis team (1-0) has 16 girls and four and public school varsity teams have 20 to 25 players,” Jakobs said. “Those schools also boys, according to senior Leonardo Eisner. “That’s fantastic for filling up the girl cate- have JV and sometimes freshman teams with gories, but we are lacking in the ability to fill around 15 players.” High school tennis competitions consist of up all of the boy categories,” Eisner, who plays the best-of-nine matches: two in boys singles, No. 1 boys singles, said. “I’m worried that some boys doubles, girls singles and of the girls will get bored and girls doubles and one in mixed drop out because some won’t be The hole doubles. Players are limited to able to play any matches.” one match each. that a The baseball team (0-2) has Unlike Country Day, most 15 players, including one girl player leaves can section teams have enough (junior Savannah Rosenzweig). often be the difplayers to fill the lineup plus a Senior Nate Jakobs, who ference in winning few backups, according to Eisbatted .571 last year with a 1.476 ner. slugging percentage and .710 and losing against “We had to forfeit almost all on-base percentage, will miss teams comparaour match days (last year),” Eisthe season after hurting his left ble to us.” knee in a skiing accident. —Nate Jakobs ner said. “(However), it doesn’t matter too much because ten“When I asked who was acnis is not a team sport like most tually serious about playing on other sports. We are all part of the team, about three or four people got up and left,” baseball coach Chris the same group but advance and play indeMillsback said. “I’ve also had a couple of peo- pendently.” Jakobs agreed the size of Country Day’s ple talk with me privately to say that they’re team usually affects its performance. not going to be able to play.” “(Last year) we had 12 players, but for most Last year, the tennis team had 14 players, while the baseball team had just 12. However, games only 10 to 11 came,” Jakobs said. “Pretty these numbers were often lower at games due often, we’re missing a key piece due to a band concert, drama recital, paste-up or other extrato conflicts with other activities. According to Jakobs and Eisner, since most curricular conflict. ference when compared to the 12th, but it’s a 33-percent increase in potential substitutes.” Jakobs said he will need six to 12 weeks of physical therapy for his MCL injury. If his knee is still unstable after physical therapy, which would indicate more significant ACL damage than expected, Jakobs will need surgery, which would take approximately a year of rehabilitation. However, Jakobs still assists with coaching. During practice, he will help players improve their skills and mental game; during games, he’ll coach first or third base. The baseball team’s next game is scheduled for Friday, March 22, at 4 p.m. against Western Sierra at Westwood Park. The tennis team’s next match is set for Thursday, March 21, at 4 p.m. against Encima Prep at Encina High School. runner Chris Wilson. Only two of last year’s participants, Johnson and junior middle-distance runner Charles Thomas, returned this season. Wilson, who competed in track his freshman year but not his sophomore year due to the small roster, said the team’s size was a factor in his decision to rejoin. “It seemed fun to be part of a big group,” Wilson said. “It makes it feel like more of a team sport.” Johnson said the large size provides new opportunities for the runners, including a relay team. Sports Boosters’ Athletes of the Month Rebecca Waterson, swim Rebecca has worked on many skills with her club coach, and it shows in her swimming. Being able to open up and make changes is important as an athlete. Rebecca has balanced the stresses of academics and athletics so well. She will be successful in whatever she does. Joe Zales, swim Joe has developed his skills over the several years I have coached him. The patience as a swimmer to see microimprovements to the breakthroughs are not easy to handle mentally, but Joe has done well. This year he had to get his training in while being on recruit trips. For information, please see SCDS homepage under the Quicklink “Parents.” Paid for by our generous Sports Boosters. Comments by swim coach Brian Nabeta. similarities in the books I read,” Monasa said. “In general, especially for fiction books, there is a very similar format used. I’m almost always recognizing that in every book I read.” The “Darkness Rising” paperback version is a 455-page read, and Monasa estimates that the other books will have similar lengths and take him the rest of high school to finish. “Darkness Rising” can be purchased in paperback ($10.99) and Kindle ($4.99) versions. Self-publishing took weeks to complete due to Amazon’s guidelines. He didn’t have an editor, illustrator or agent because of the expense. “I’m not expecting to make much, so I’m not ready to invest money into the process until I think it’s financially worth it,” Monasa said. “With my book’s length, it would cost thousands of dollars to get a team of reasonable quality. “With the publishing industry, you get what you pay for. I don’t want to pay for something that isn’t worthwhile, and the stuff that is worthwhile is out of my budget.” Profits are small, with only 28 cents and $3.35 earned for each paperback and Kindle version bought, respectively, according to Monasa. “Publishing is fun, but it’s more of a way to justify what I’ve done or give it a purpose so I don’t have a bunch of things I’ve written just sitting on my computer,” Monasa said. “It gives me something physical that I can look at, pick up or read. That’s really cool for me.” So far, the readership of “Darkness Rising” consists of Monasa’s family and friends. onto the cardboard layer by layer. “It’s a mind-numbing thing,” Woo said. “You get to be creative — the possibilities are endless. It’s pretty methodical. You can just put on a good Netflix show and just cut the fringes and glue forever.” But the next step was the downfall of her piñata producing: shipping. Shipping necessitated a box and stuffing to protect the delicate item, along with a trip to the post office for Woo’s mother. It also added to the piñata’s price, which totaled $19. Because the shipping process was too much work, Woo’s mother told her to stop selling piñatas and offered to help set up a photography website. Woo plans to sell her photographs using Squarespace, and a link to her Etsy account will be embedded for purchase of photo prints. Additionally, Woo wants to sell puzzles of her pictures. Go to www.scdsoctagon.com to read about junior Héloïse Schep’s award-winning product design of a “stroopwafel” clip — created when she was 11! 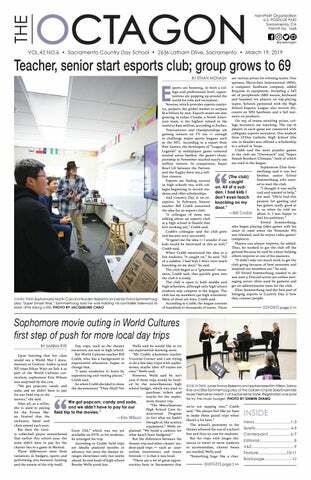 Paul Bauman The Octagon is Sacramento Country Day School’s student-run high school newspaper. Its purpose is to provide reliable information on events concerning the high school and to inform and entertain the entire school community. The staff strives for accuracy and objectivity. The Octagon aims to always represent both sides of an issue. Errors in stories will be noted and corrected. The Octagon shall publish material that the staff deems is in the best interest of the school community. The staff recognizes the importance of providing accurate and reliable information to readers. The Octagon does not represent the views of the administration nor does it act as publicity for the school as a whole. 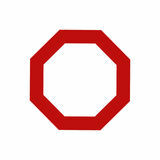 The Octagon will publish timely and relevant news, subject to the following exceptions: obscenity; slanderous or libelous material; and material contrary to the best interests of the school community, as judged by guidelines between the newspaper staff, adviser and school administration. Editorials are approved by an editorial board. Columns/commentaries shall be labeled as such and represent only the author’s opinion. In the interest of representing all viewpoints, letters to the editor shall be published, unless otherwise requested. All letters must be signed and conform to above restrictions. The staff may change grammar and punctuation or abridge letters for space. Comments may be made online to address all stories run. freshmen to take a gap year, such as volunteering around the world. For instance, Princeton’s Novogratz Bridge Year Program allows students to spend nine months doing service work in either Bolivia, China, India, Indonesia or Senegal — all tuition free. The Bridge Year website states that it “aims to provide participants with greater international perspective and intercultural skills, an opportunity for personal growth and reflection, and a deeper appreciation of service in both a local and international context.” While we applaud the work of the college counseling department in helping students and parents navigate college admissions, students need to be made more aware of the benefits of gap years — not just for unusual cases like Chiu’s and Sommerhaug’s, but also for any students looking to broaden their worldview, gain independence, discover their passions, give back to the community or work and earn money. Plus, with so many colleges offering their own gap year programs, letting students know about the opportunities provided by specific institutions could be another factor in deciding where to apply. C-day meetings would be the perfect place to hold these conversations. Juniors just starting the college process might not realize just how helpful a gap year could be, and hearing about it from a counselor could help them plan their future. After all, there are just as many benefits to gap years as there are to matriculating directly into college — if not more. Friday nights during my pre-calculus summer course were when I could get together with friends and unwind by destroying other players in a game of “Fortnite.” All of us usually died within the first two minutes, but at least we were persistent. On PC, of course. And, yes, I stayed up late. One morning, though, my mom told me to stop playing and study. I tried to explain that gaming is fun and relaxing, but she said, “Video games are useless and addicting.” My parents are against gaming, yet they’re fine with watching TV — which people watch five hours per day on average, according to the New York Times. Then, this year, I started coding — with my parents’ approval — to pursue my goal of becoming a game developer — to their disapproval. They said game development doesn’t involve much coding — which is horribly wrong — and that learning to make games won’t help me succeed. To my parents, it was sound advice. To me, it was an insult. Since the emergence of Atari’s “Pong” in 1972, the popularity of video games has increased exponentially. Animation became three-dimensional, consoles shrank from the size of a fridge to the size of your palm, and games transformed from 8-bit to 4K to even virtual reality. The rapid development of the gaming industry is directly linked to its popularity. A study by the Entertainment Software Association in 2018 showed that 60 percent of Americans play video games daily — only 17 percent of whom are children. However, many — at least my and my friends’ parents — think video games are a nefarious waste of time. Yes, staring at a screen excessively can cause general discomfort, but the key word is “excessive.” Too much of anything is bad for you! If you read for five hours straight, your eyes will get tired; if you exercise for too long, your muscles will be damaged. And besides, there are also positives to gaming. For one, gaming can be beneficial if done healthily. A 2018 Psychological Bulletin study showed that gaming for over five hours a week led to improved perception, coordination, attention and cognitive flexibility. Also, with gaming’s prominence, it makes sense to pursue a job in gaming as a streamer, developer or competitive player. According to Statistica, the revenue of the U.S. gaming industry in December 2018 was $3.42 billion. According to CNBC, Rockstar Games’ “Red Dead Redemption 2” earned $725 million in retail sales in the first three days of the game’s release, toppling Disney’s film “Avengers: Infinity War” — which had the highest-ever opening weekend-box office of $640 million. Finally, gaming is good for bonding; after a day of hard work, nothing beats getting in a group call with friends and playing “Destiny 2.” Since I can’t meet my friends overseas in person, playing online is the perfect way to renew our friendship. Gaming is a source of entertainment, not addiction. It’s a relatively new concept and still underrepresented in the community, even with its popularity — and I’m doing my part to shed light on the topic. Gamers, rise up! SLIPPER SUPPORT A Blush employee rolls senior Chardonnay Needler’s pants down to protect her still-drying fingernails before Needler left the salon. PHOTO BY EMMA BOERSMA hairdressers. Almost two hours and $144 later (we both added 20 percent tips on our $60 bills), we left; I had a to-go cup of tea in my hand. While my pedicure is still in flawless condition, my nails chipped within a few days. Their chipping wasn’t due to roughness or carelessness on my part, as they had dried a little unevenly to begin with. All in all, the experience made me want to return. We both left rejuvenated and relaxed. The prices, however, still leave me with cold feet. and accurately, but I didn’t know what they were talking about — or what was so funny. (I’d been watching the Ken Burns I hadn’t even sat down at Noble bright white Square Reader in our “Vietnam War” documentary, and Nails before the lady who did my direction. the only Vietnamese I understood nails began to chat. “Pay, pay — you pay now,” she was “nỗi s chết” — “I am/was afraid “Miss, you want acrylic gel?” she said. of dying” — a phrase I didn’t hear asked me the moment the receptionSo it was time to pay. Each manithe ladies say.) ist showed me to my table. cure was $15, and we had to pay beIt dawned on me “No, thank you,” I said. The sa- fore they did anything else. during the manicure lon’s “Gel Express” cost $25, $10 There wasn’t anything elaborate that Blush hadn’t apmore than the regular. (For the sake about the pre-polish care: plied a top coat at of equal reviewing, Emma and I a quick soak in lukewarm the end, possibly stuck to regular at both salons.) water, nail shaping and why the polish “Are you sure?” she continued. “It a quick trim. The trim chipped so dry quicker and stay longer.” was much better than quickly. Emma, meanwhile, was fascinat- Blush’s, without any Within 45 ed by the gel examples proudly dis- snagged nails or flaky or minutes from played on each table. irritated cuticles. the start, our “Whoa, these are so cool!” she “Oh, yeah, these are way nails were ready to said as she reached for the faux-gar- better,” Emma said. “The be dried. By that time, net-studded the patronage in the translucent nails once-packed salon had It was more relaxing to chat with ladies dwindled to only a few on display. than to be told to stop laughing so we And the womcustomers, and the store an doing her wouldn’t shake the table.” was still open after 7. nails tried hard As for pedicures, —Needler to convince her the chairs had various to switch to gel. massage settings for the But once we had back and behind, but finally affirmed our decisions — shape is so much rounder.” there was no pumice or bath salts After the nails were primed and like at Blush. multiple times — she brought over the one rung of non-gel swatches shaped, we had to walk over to the Yes, we left Noble Nails with betsink and — after experimenting ter nails. My hands were a tad dry they had. Although Noble Nails Spa didn’t with the strange, circular faucet after going to Blush; I had white skin have as many colors as Blush, it was handle that went from fire-hot to near the nail beds. But we didn’t easier to choose — dark blue for me freezing-cold with only a 3-degree have the same experience. turn — wash our hands. and orchid for Emma. It was more relaxing to chat with Then we returned and had our ladies than to be told to stop laughAlong with the swatches came the hostess’s iPhone, as she pointed the coats done. The ladies worked fast ing so we wouldn’t shake the table. (Nick Rockwell), his best friend,” Longoria said. “Later that day, Rock sent me a text: ‘Hey, we’ll be in LA later today. Any chance you can make it down there at some point? Also, Dez wants to know if you can do some video shoots for him.’” Longoria went, which allowed him to attend a Halloween party in Bel Air as well as a birthday party for Cleveland Browns wide receiver Odell Beckham Jr. (OBJ). “OBJ’s definitely an entertainer, but he is low-key and was enjoying his party,” Longoria said. Longoria also said he met James Corden, the host of “The Late, Late Show” on CBS. “No one was confident enough to go dance with him or hang out with him,” Longoria said. “I went up to him and started dancing with him. He’s a fun guy, an entertainer. You can see why he has his job.” In addition to meeting celebrities, Longoria started a company called NoBrakes that sells premium athletic apparel and will launch its first line this spring. “Our business model is going to follow Gymshark’s, which stayed with a small circle of influencers,” Longoria said. “(Gymshark) has around 60 athletes and just did $120 million in revenue, and they’ve only been in business six years.” Longoria hopes to outpace that. “If in six years we’re doing more than them, I’ll be content,” Longoria said. Longoria conceded that lots of money flows back to the company. “Lululemon is now an $18 billion dollar company, so you’re looking at a growing industry,” Longoria said. Nike and Adidas pay athletes to endorse their products, but Longoria will use social media influencers. “I spend most of my day working on NoBrakes, communicating with our manufacturers or trying to scout more talent,” Longoria said. Although Longoria likes working on NoBrakes, he said he likely won’t take another gap year. “For me to forgo college a second year, I’d have to make pretty drastic progress,” Longoria said. “ Longoria said he won’t decide until the end of summer and doesn’t know where he would attend college. The Virginia Cavaliers remained in the top five throughout the regular season. At 28-2 — their only losses against Duke — the Cavaliers had eight victories against Top 25 teams, including three against top-10 teams. Consistency and defense have kept Virginia in the conversation even without the “wow” factor. With a nearly flawless record against a strong schedule, the Cavaliers made a strong case for the No. 1 overall seed in the Big Dance. That in mind, I have them as a lock for the Final Four and certainly a contender. However, after losing to Duke twice already, I don’t see them rebounding under the pressure of the NCAA Tournament. Maybe Virginia gets lucky and another team knocks off Duke. The North Carolina Tar Heels made a big splash after being overshadowed by neighboring Duke early in the season. Winning 14 of its last 15 regular-season games, including two wins over Duke and five wins over top-16 teams, North Carolina climbed to No. 3 in the country — and deservedly so. Although not as talented as Duke, UNC boasts experienced coaches and players. Roy Williams is in his 16th season as the Tar Heels’ head coach, while seniors Cameron Johnson and Luke Maye provide the backbone for the team. Overall, I still favor Duke and Virginia over UNC in a head-to-head matchup in the Big Dance. Sweeping Duke is impressive, but UNC has yet to face the Blue Devils with Zion Williamson. Frankly, I have more faith in a healthy Duke team. The Duke Blue Devils have dominated college basketball this season behind their young talent: Tre Jones, Cam Reddish, R.J. Barrett and most importantly Zion Williamson. In Duke’s first meeting against North Carolina (UNC), Williamson busted open his shoe after trying to make a cut, straining his right knee. The Blue Devils went on to lose 88-72 to the No. 8 Tar Heels. Duke wasn’t the same team without Williamson and his 21.6 points per game. But with Williamson, Duke is a powerhouse. One might argue that inexperience and poor free-throw shooting will show. However, with coach Mike Krzyzewski at the helm, I have full confidence that Duke will go deep into March and April, especially now with a healthy Williamson, and win the title. Coach John Calipari has transformed the Kentucky Wildcats into a one-and-done machine, producing NBA lottery picks year after year. Talent has never been the problem; it’s hard to bring a brand new team together each year. After a slow start, the Wildcats won 16 of their last 18 regular-season games. Kentucky will always be in the conversation during March because of the tremendous talent it acquires each year. The Wildcats have shown they can beat formidable opponents, but they have also lost against weaker ones. I foresee the Wildcats making the Elite Eight, but I wouldn’t be surprised to see them exit sooner. That being said, they could make a title run, but they needed to gain some momentum in the Southeastern Conference tournament to be convincing. The Gonzaga Bulldogs were ranked No. 1 with the most ppg (88.8) in the country after maintaining a top-five ranking throughout the regular season. Similar to the other teams, Gonzaga is a top program with an experienced coach. Mark Few is coaching his 20th straight season of 23 wins or more. However, Gonzaga’s strength of schedule is abysmal. The Bulldogs have played only three ranked teams all season — Duke, UNC and Tennessee — losing twice. Beating Duke is impressive, but the Bulldogs later lost to UNC by 13 and Tennessee by three, suggesting that they caught a young Blue Devils team off guard early in the season. Gonzaga should breeze through teams to the Elite Eight, but the Bulldogs’ weak schedule will show when they face top-tier teams in later rounds.